With the CAT results out and the pressure of selecting and getting selected at a good B-School draws in, I reflect on my experience last year and how far I have come. As we all know choosing a proper B-School after the CAT results is a task in itself. And after that getting through the process of your desired one. For me, the journey right from my selection process till date has been an enriching experience. IMI, unlike other B-Schools, had a WAT PI process that had extempore included during PI. Initially, I was really nervous, being a fresher and having chosen the specialization course of PGDM-HR provided by IMI, I had to learn how to justify my choice and how to put forth whatever I had achieved till then and what I expected from the future. Once I got through and arrived here, I realized IMI not only focused on Academics but provided a platform for us for our overall growth. In the first Induction week itself, we were introduced to GD rounds and given feedback by our seniors. I had been quite nervous throughout the week. Prior to the induction week, the learning process changed. We attended classes that included more of practical exposure than textbook studies which made it more interesting and easy to retain knowledge. Faculties use case-based and presentation based pedagogy in the class. Initially, it was difficult but with time and with the help of not only professors but also my peers I got better at public speaking and presentation skills. And simultaneously we had our selection process for Committee’s, Club’s and Society’s going on. Those selection procedures in itself were very interesting. There were simulations and interviews for every process which made us really comfortable for such situations to be faced in the future. It also taught us time management as we balanced classes and procedures side by side. Personally, it helped me in boosting my self-confidence a lot. And we also had fun tasks where we got to interact with seniors and batchmates that happened quite often bought us together as a batch. At this point, we learnt a lot about networking – which of course is an important part of this journey. There were opportunities for live projects and corporate competitions on every step that taught us a lot regarding competition and real-life situations. Basically, it is a path full of opportunities that you need to utilize on time. We got a lot of opportunities to showcase our talent in sports as well. Because here we have all kinds of sport from indoor to outdoor with proper space to support all. 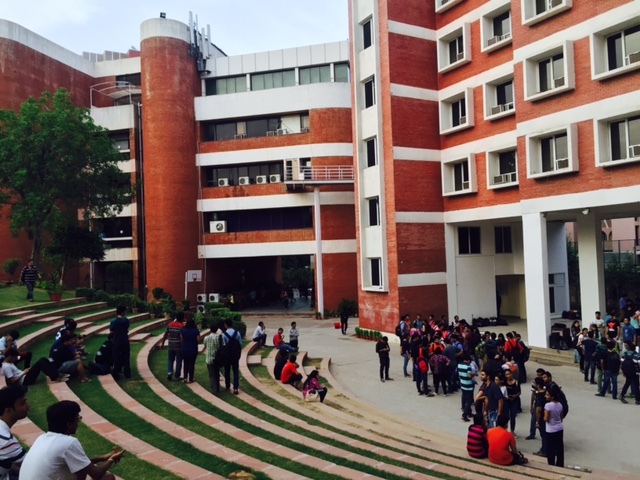 The stage and amphitheatre are mostly used during the events held by the student bodies. Almost every event here is run by student bodies that add to the learning experience as we get to host events, we learn to take responsibilities. And the success of the events we conducted was a satisfying experience. Or situations we faced while events taught us crisis management. Then we came to the phase of going through our campus summer internship placement process. Before it started we were provided with various mock interviews and GDs so we could prepare well. All the processes took place in organised professional fashion. And seniors placements had a significant improvement from last year that boosted our confidence further. With the cultural and corporate events further lined up, I am looking forward to improving myself further and learning a lot more through this journey. Here, I met with many peers who definitely taught me a lot about diverse cultures across India. I got the chance to make a lot of friends, some for a lifetime. I also got a chance to learn about cultures abroad by interacting with our foreign exchange students here. Somehow, I feel IMI has shaped my personality within this short time. By now I have become quite a different person from what I started off as when I joined.